Magnetic phenomena were first observed at least 2500 years ago in fragments of magnetized iron ore found near the ancient city of Magnesia (now Marisa, in western Turkey), These fragments were examples of what are now called permanent magnets; you probably have several permanent magnets on your refrigerator door at home. 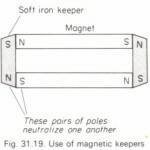 Permanent magnets were found to exert forces on each other as well as on pieces of iron that were not magnetized. It was discovered that when an iron rod is brought in contact with a natural magnet, the rod also becomes magnetized. When such a rod is floated on water or suspended by a string from its center, it tends to line itself up in a north-south direction. The needle of an ordinary compass is just such a piece of magnetized iron. Before the relation of magnetic interactions to moving charges was understood, the interactions of permanent magnets and compass needles were described in terms of magnetic poles. If a bar-shaped permanent magnet, or bar magnet, is free to rotate, one end points north. This end is called a north pole or N-pole; the other end is a south pole or S-pole. Opposite poles attract each other, and like poles repel each other (Fig. 28-1). An object that contains iron but is not itself magnetized (that is, it shows no tendency to point north or south) is attracted by either pole of a permanent magnet (Fig. 28-2). This is the attraction that acts between a magnet and the magnetized iron door of a refrigerator. By analogy to electric inters actions, we describe the interactions in Figs. 28-1 and 28-2 by saying that a bar magnet sets up a magnetic field in the space around it and a second body responds to that field. A compass needle tends to align with the magnetic field at the needle’s position. The earth itself is a magnet. Its north geographical pole is close to a magnetic south pole, which is why the north pole of a compass needle points north. The earth’s magnetic axis is not quite parallel to its geographic axis (the axis of rotation), so a compass reading deviates somewhat from geographic north. This deviation, which varies with location, is called magnetic declination or magnetic variation. Also; the magnetic field is not horizontal at most points on the earth’s surface; its angle up or down is called magnetic inclination. 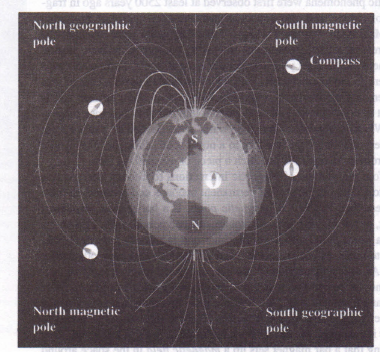 At the magnetic poles the magnetic field is vertical. Figure 28-3 is a sketch of the earth’s magnetic field. The lines, called magnetic field lines, show the direction that a compass would point at each location; they are discussed in detail in Section 28-4. The direction of the field at any point can be defined as the direction of the force that the field would exert on a magnetic north pole. In Section 28-3 we’ll describe a more fundamental way to define the direction and magnitude of a magnetic field. The concept of magnetic poles may appear similar to that of electric charge, and north and south poles may seem analogous to positive and negative charge. But the analogy can be misleading. While isolated positive and negative charges exist, there is no experimental evidence that a single isolated magnetic pole exists; poles always appear in pairs. If a bar magnet is broken in two, each broken end becomes a pole. The existence of an isolated magnetic pole, or magnetic monopoly, would have sweeping implications for theoretical physics. Extensive searches for magnetic monopolies have been carried out, but so far without success. interactions between moving electrons in the atoms of the bodies (above and and the electric interactions between these charges). Inside a magnetized body such a permanent magnet, there is a coordinated motion of certain of the atomic electrons; an un magnetized body these motions are not coordinated. (We’ll describe these ions further in Section 28-8, and see how the interactions shown in Figs. 28-1 and -2 come about.) Electric and magnetic interactions prove to be intimately intertwined. Over the next chapters we will develop the unifying principles of electromagnetism, culmination the expression of these principles in Maxwell’s equations. These equations the synthesis of electromagnetism, just as Newton’s laws of motion are the thesis of mechanics, and like Newton’s laws they represent a towering achievement the human intellect.